Our doctors are highly trained in their field with years of experience. They are also nationally recognized by the nations top retina associations. We are dedicated to educating our patients regarding retinal diseases and treatments and becoming partners for long-term eye health. If you have an emergency after hours, one of our doctors will always be on call to assist you. Dr. Gross – Very sweet, very nice, warm. Great to talk too Very precise, zeros in on every aspect of my vision. Deeply concerned with my eye sight. Professional Reassuring doctor. Felt at ease in his care. I have high energy, but Dr. Gross was calming. When others couldn’t, Dr. Gross saved my eyesight. Best care I’ve ever received from a physician. Can’t speak highly enough of him. Moved out of the region, but plan on coming back for check-ups. - T. U. In compliance with HIPAA Privacy Regulations, here is a Notice of Privacy Practices for all our patients. 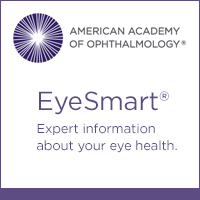 EyeSmart contains comprehensive, ophthalmologist-reviewed information to help people understand how to keep their eyes healthy and when to see an ophthalmologist. The Academy maintains EyeSmart as a service to its member ophthalmologists and their practices. Click the EyeSmart icon to be directed to the site.